Hi gang, Todd here again. First, the good news: Anna is feeling much better and will probably be back tomorrow or the next day. It turns out, after a visit to the doctor’s office twice and the ER at 3am on Saturday, that she has pneumonia. She’s already up and around, and was well enough to make us dinner tonight! Now for the not so good news: you are stuck with me for one more post, and I still can’t cook or bake. Going for as long as we did without Anna to cook for us, last night Fuzzy and I were running out of unique things to heat up. So, I did what any reasonable father would do and ordered pizza from Domino’s at Fuzzy’s suggestion. One of her friends really likes the lava cake they sell, so I agreed we could try that. At least I would have something to write about, was my reasoning at the time. Now, I haven’t ordered a pizza to be delivered in quite some time (Anna usually makes pizza, so we don’t need to order out), but the Domino’s online order experience was very cool. Go online, use the pizza configurator thingy to tell it what you want, and your pizza is on the way, all without interacting with another living human being. Let me point out that in the Ginsberg household, this is a HUGE plus as neither of us really likes using the phone. Once that part is done, you can watch your order progress through its various phases with their Pizza Tracker, also without interacting with real people. You can see the name of the person making it, how much bake time is left (for the pizza), and the name of the person on their way to deliver it. I don’t want to spoil the ending, but the Pizza Tracker is easily the best part of the Domino’s Pizza experience. Sadly, Domino’s hasn’t perfected a robotic delivery system, and an actual living breathing dude showed up with our pizza and lava cake. Don’t get me wrong, he was perfectly nice, but a robot would have been so much cooler. If anybody from Domino’s is reading, get on that, stat. This isn’t the greatest picture in the world of a Domino’s lava cake, so I apologize. I also didn’t get any good pictures of the actual lava parts flowing out, so I’m sorry for that as well. Here’s the fun part of this lava cake review – after eating my pizza, I felt like I had swallowed a brick and lava cake was the last thing in the world I wanted inside me. Luckily for you, gentle reader, Fuzzy didn’t have any problems like that and provided the following insightful review: It was awesome! There you have it. “But Todd”, I can hear you saying, “tell us something about the cake!”. Well, I hate to break it to you but I know nothing about how this cake was produced, what kind of oddball ingredient it almost certainly has, or what kind of fancy process was used to make it. I clicked a button on the internet and cake showed up. Seems straight forward to me. Seeing that I didn’t get to eat mine, perhaps Anna will have it and write some kind of review for it . Man, this blogging thing is so much harder than Anna makes it look. I’m going to go back to the relatively easy job of writing banking software for a living. So long! Toasted Hazelnut Bars Plus Oh Nuts! Todd, you did a great job and I’m glad to hear that Anna is feeling better! Todd, you’re cracking me up! Great post. Send get well wishes to Anna– sounds like a rough go around! I’m glad she’s starting to get better. Man, that’s rough. I also prefer not to interact with another human being. I hate using the phone! I just text everyone. If I ever have to make an appointment for anything I get super nervous on the phone and my voice gets all squeeky like an adolescent boy. The pizza looks pretty good. I might have to try out the tracker sometime. I think the fact that the lava cake was “awesome” tells me everything I need to know. I enjoyed this post and the one about Lizzy. Great post Todd, you’re writing is fun to read! Feel better soon Anna! Feel better soon, Anna! Get lots of rest – nurse’s orders! Great to hear that Anna’s feeling a bit better. And I must say that I am quite enjoying your posts. Maybe you should have a weekly feature :). Although I haven’t used Domino’s online ordering system (it’s probably a little different in Canada) I have been happily ordering pizzas online for 6 or 7 years now, nothing beats not having to talk to someone who is invariably going to mess up your order 🙂 But the best part of your robot idea? No tip :). Amusingly enough, I write bank software too, and you’re right, it is easier than blogging :). Thanks for the Domino pizza update. I haven’t ordered from them in a while. Who knew that pizza delivery has gone hightech? Thanks for the updates and the really fun blog posts! So cute. Hope Anna is feeling better though this commentary is pretty funny. Hope you are feeling better soon, Anna! Todd – you did a great job filling in for her. My husband could never do that on my blog, although he could order a pizza. Glad to hear Anna is on the mend! Great post, again, Todd! We like restaurant reviews. We order Pizza Hut online all the time, too, and have never had a bad experience. Always looking for great lava cake!! Todd-Great post! I wish all of my pizza ordering experiences were automated. Sometimes it is just too painful to talk to some of those people. I make most of our pizzas homemade also. Yay for Anna getting better. Another great guest post Todd! Are you sure you don’t want to jump into the blogging game? Wishing Anna all the best on her recovery. 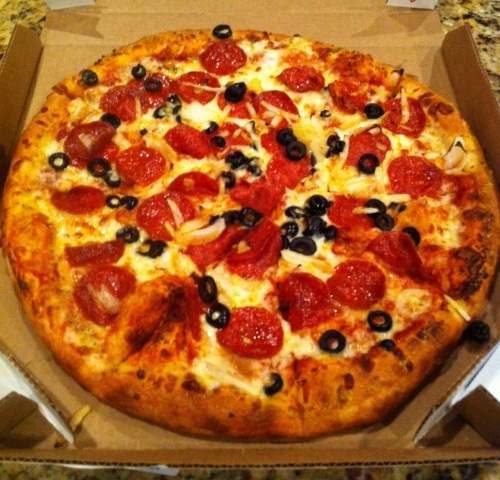 Domino’s — the dinner of champions! …or poor undergrads, in my experience. I just have to say it’s a really good thing they hadn’t perfected this magic robotic ordering system when I was still in school, or I have a feeling my friends (in varying degrees of competence) would have felt the need to order endless amounts of pizza solely to use the super cool tracking devices. Good to hear Anna is on the mend! Todd, I’m glad Anna is in recovery mode now. Lava cake was a fad food for a while, so we can “stir up” some recipes for Anna and Fuzz to make after Anna’s well. Glad for the update, and the great post about Domino’s! Glad to hear Anna is recovering! Your posts have CRACKED ME UP Todd! Glad Anna is feeling better but you have been a fun sub:-). Hope she’ll get well soon!!!! Oh, for the metabolism of an active and precocious elementary school child again! Pretty high praise for dominos if one of Anna’s main taste testers is calling their cake awesome. Glad to hear she’s feeling slightly better. So glad to hear Anna is feeling better! Thank goodness they have good drugs these days. Todd, you are a natural poster! I too think you should post once in a while-maybe about not-baked-from- scratch items-many of us don’t bake and cook from scratch all the time! LOL! Your holding the fort down well for Anna. I think you should however, have maybe a monthly spot here on the blog. Just a little nod from the receiver of Anna’s cooking talents. I’m glad to hear that Anna is feeling better. It sounds like she’s had a rough time of it! Thanks for the Domino’s review. I didn’t even know they had lava cake! Like Anna we make our own pizza, but your photo makes your pizza look so good maybe we should reconsider! I hope Anna feels better quickly, but I have to say, I’ve enjoyed your posts! You’ve been a lovely fill-in for Anna. She has really, really big shoes to fill. Or would that be pans to fill? Glad to read that she is feeling better….and that you and Fuzz managed to survive.